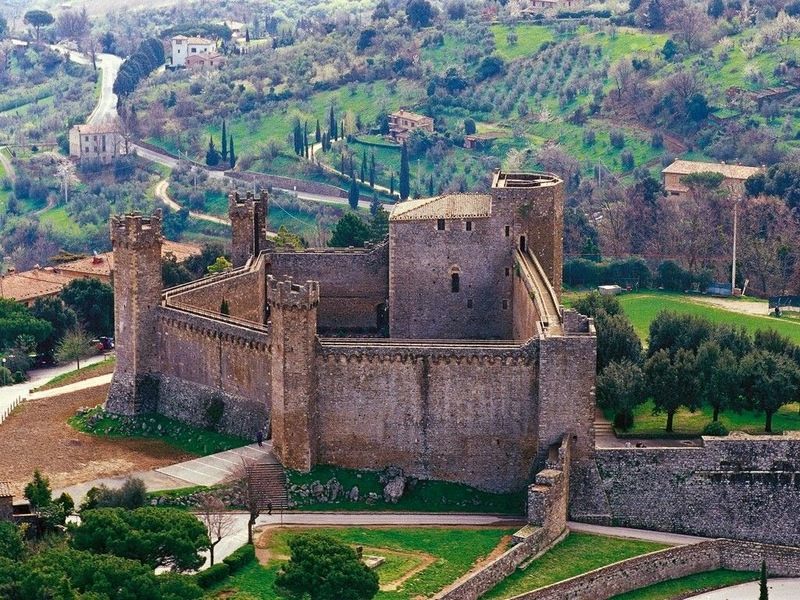 Montalcino has been graced with many excellent vintages over the last decade. Beginning with 2004, 2006, 2007 and the hopeful promises of 2009 and 2010, producers in and around the tiny village of Montalcino have many reasons to be gratified. To a soul, many have remarked to me that they cannot remember a greater string of top vintages. Most retailers continue to sell the 2006’s and 2007’s. Even in my selection rich market, it’s unusual to find a merchant selling a large selection of 2008 Brunello. By law, Brunello may be released in January of the fifth year following the harvest. Despite this, as of this writing, many 2008’s have not yet been released. However, as the autumn breezes begin to roil, wines from the current vintage are beginning to trickle to market. What better time to analyze the vintage and shine a light on the most recent wines coming from Montalcino? Over the past several months, TuscanVines has been conducting extensive tastings of 2008 Brunello in order to provide readers with insight as to the overall characateristics of the vintage and it’s wines. Generalizations are limited by their very definition. However, as I progressed through these tastings a pattern became easy to discern. The consistency among the wines is the first thing that became apparent as we tasted the samples. In fact, the consistency was so perceptible as to approach homogeneity. The 2008’s are not powerful like the 2006’s. They are not as concentrated and exuberant with their fruit like the plush 2007’s. 2008 was a cool growing season marked by degrees of rainfall during harvest. The key for the producers was waiting to harvest until after the rains had subsided. Those who did fared better than those who did not. The 2008’s tasted for this report were very nice wines. They are elegant, in a delicate feminine manner. They are highly aromatic and have pleasing, mouth watering acidity. However, they lacked the power or masculinity of the aforementioned vintages. Many of the wines seemingly display no tannic structure to their texture. They are wines that will be best suited for near term consumption over the next 3 to 5 years. Indeed, 2008 will be an ideal “restaurant vintage” as the wines will afford early charm and accessability. This sort of characterization should not be dismissed. 2008 presents a wonderful opportunity to enjoy the best wines of the vintage while providing a “barrier” between your corkscrew and the wines in your cellar that could benefit from additional aging. The key for the consumer is to identify those wines. As is the case with all comprehensive Tuscan Vines tasting reports, all wines were tasted with food in a casual relaxed setting with a keen eye toward preparing dishes that would allow the wine to show best. Almost all wines were decanted at least 30 minutes prior to the initial tasting and many evolved slowly over the course of the meals. Suggested Retail Prices have been provided by the Importers & Distributors that provided the samples for review. Col d’Orcia sits atop a large crest overlooking the Orcia river. Indeed, the topography is responsible for the estate’s name which literally means “Hill overlooking Orcia”. In the past, I have not been particularly enamored with the Brunello from Col d’Orcia but this organic producer crafted a very pretty wine in 2008. 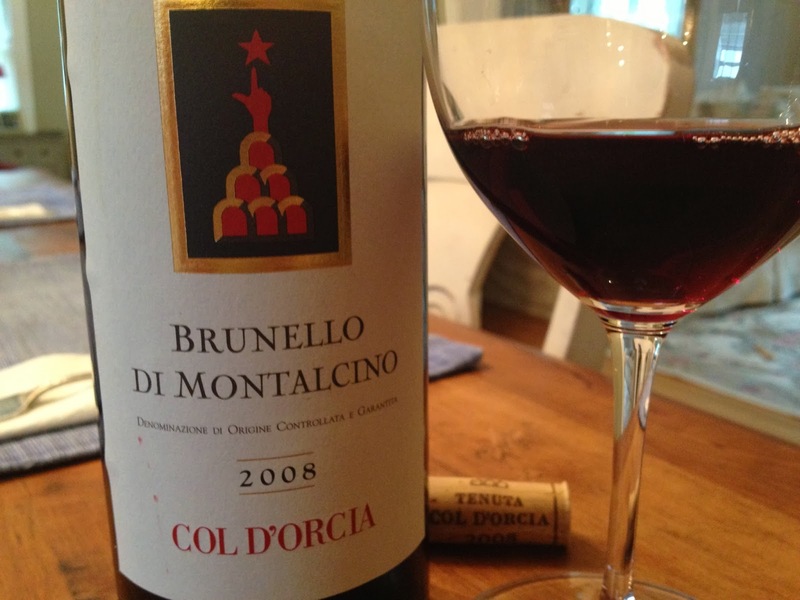 The 2008 Col d’Orcia Brunello is a pretty, dark ruby color that widens to that trademark copper rim toward the edge of the glass. On the nose, expressive aromas of cherries, spice and sandalwood are easily discernible. As the wine opened, the nose developed an intriguing anise/fennel undertone. On the palate, the wine is well balanced. Flavors of mocha, spicy cherry and savory herbs play well together. The acidity gives the wine plenty of freshness. Medium bodied with no tannic grip, this is delicious right now. 91 points. SRP ~ $50. Perched atop it’s own little hill is the Castle Poggio Alle Mura which Castello Banfi calls home. One of the largest producers in Tuscany, Castello Banfi consistently crafts wonderful wines at varying price points. This is even more impressive given that the average case production of their estate Brunello can approach 50,000 cases. Widely available and affordable, the 2008 Castello Banfi Brunello shows winemaker Rudi Buratti’s deft hand in a difficult vintage. The 2008 is a dark ruby trending toward garnet with some darker maroon reflections. The nose of this wine is very feminine, very delicate; with perfume, flowers and a spicy almost newly mown grass note that hides taciturnly behind the crushed berry notes of the wine. On the palate, there’s a pretty core of freshly crushed raspberry with vanilla, cherry, and a hint of cured olive toward the finish. Medium bodied and zesty with tannins in check. Drink now and over the next 3 years. 91 points. SRP ~ $45. Lying just north of Castello Banfi is their neighbor, Tenuta Argiano. Sprawling over 100 hectares, Argiano is one of the largest estates in Montalcino. After being purchased in 1992 by Noemi Cinzano, the winery was recently sold (2/2013) to a group of private investors. As of this writing, no changes are planned to the winemaking team at Argiano. 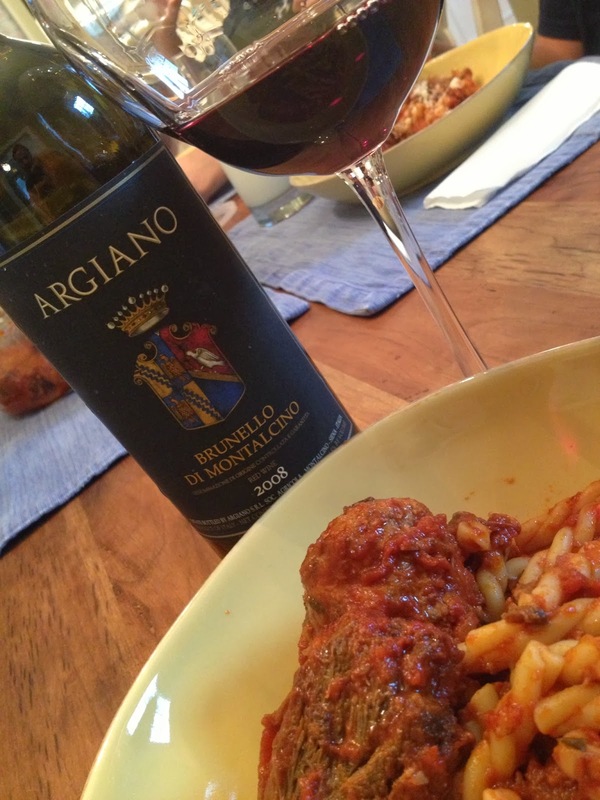 The 2008 Argiano Brunello di Montalcino displays a deep ruby color with only a slight fade to the rim of the glass. The floral notes on the nose of this wine are intensely aromatic. Bright, vibrant berry aromas are accented with Tuscan herbs and hay. There are loads of flavors on the palate. Berries, mocha, spices, and earthy notes contrast well with the core of bright fruit. This is very fresh and the acidity keeps the wine lively. Despite the absence of tannins, the freshness and concentration to the fruit suggest this will hold well in a cellar for 5 years at least. 90 points SRP ~ $45. My good friend Dennis first introduced me to the wines of Ferenc and Candace Mate and I’m the richer for it. Nestled in a small corner of Montalcino, the Mate winery is a tiny, artisan endeavor but is quickly garnering attention, especially among the local Montalcinese. 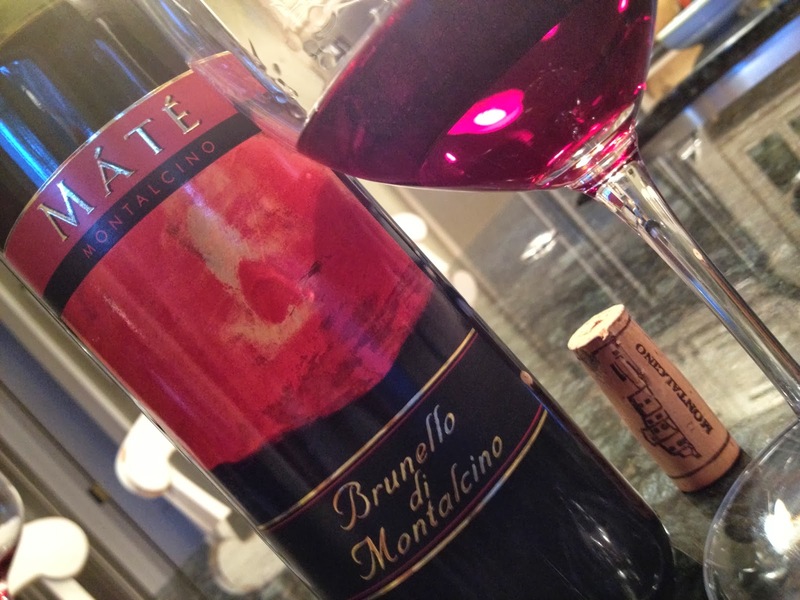 The 2008 Mate Brunello is a vibrant violet color with a deep ruby core. The wonderful aromatics leap from the glass. There’s a large frame of crushed red fruits supported by comfortable broken-in leather, sweet pipe tobacco, and flowers. On the palate the wine displays impressive concentration with a monstrous core of rich, ripe berry fruit, tobacco and savory Tuscan herbs. This is so delicious. Wonderful balance, and although only moderately tannic, the acids create a lively, mouth watering sensation. This is great wine. 93 points. SRP ~ $50. Next up is Giacomo Neri’s Casanova di Neri bottling, “Etichetta Bianca”, with the special designation of being the 30th vintage in production. Perhaps now known for his two outstanding upper tier Brunello; Tenuta Nuova and Cerretalto, it would be a mistake to overlook this Brunello because it typically represents great value given its moderate cost. 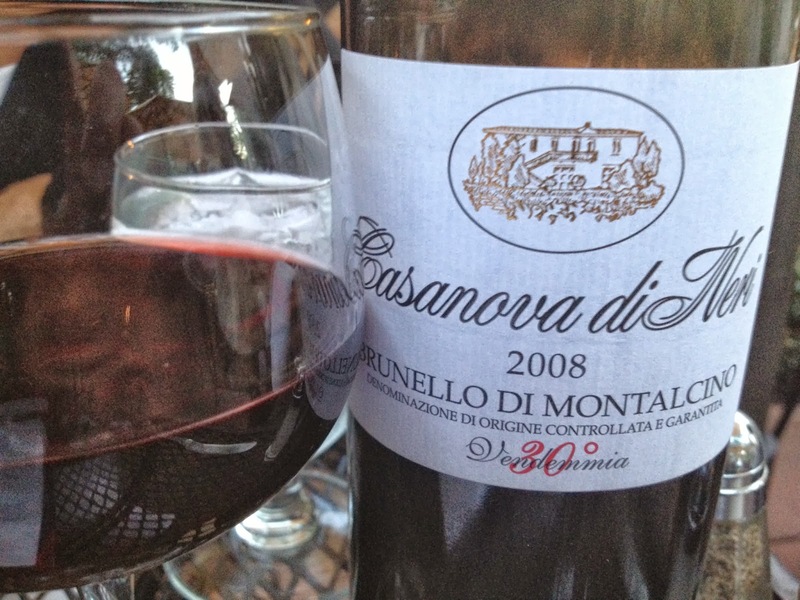 The 2008 Casanova di Neri Brunello is a dark black trending to ruby. This was one of the darkest wines in this report and it is the exclusive use of barrique to age the Sangiovese that contributes to the final color of the wine. On the nose, there are relatively straight forward aromas of cherry framed by some fresh oak aromas. Not a lot of complexity here. On the palate there’s more black cherry and less of the typical red fruits you’d expect. There’s spice and noticeable tannin contributed here from the oak. This is good enough, but not anywhere near as nice as the 2006 or 2007 version of this wine. It clearly lacks some of the elegance and aromatics present in some of the other wines in this report and I get the sense that they tried to “muscle up” this vintage with a more aggressive application of oak. I think that was a mistake. 88 points. SRP ~ $34. In the 1980’s Agricola San Felice purchased the tiny, 14 hectare, Campogiovanni Estate near Montalcino. The estate is a gorgeous property and produces consistent wines in their traditional style. 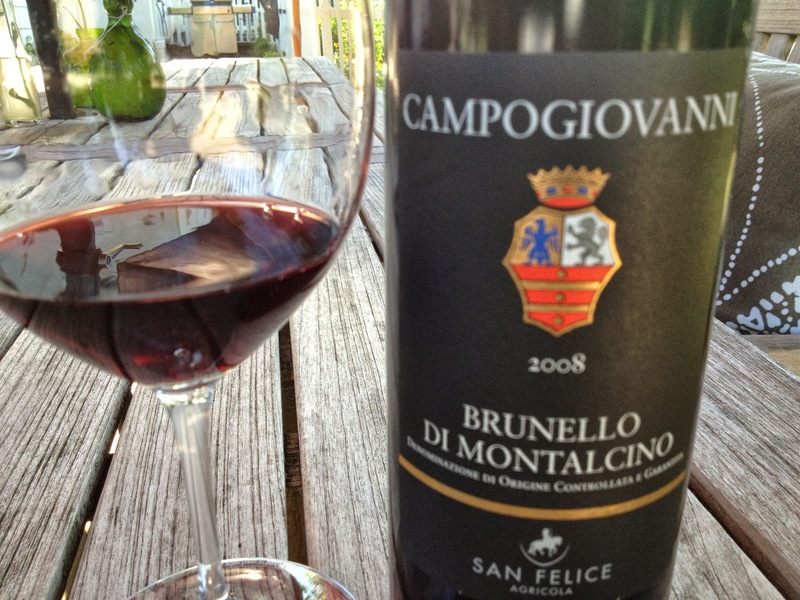 The 2008 San Felice Campogiovanni Brunello is a solid dark ruby and displays all the classic hallmarks of a Brunello aroma. There’s ample flowers, with cedar, mushroom and bright berry notes. Very attractive. On the palate the wine is medium bodied, with more tannic structure than some of the other Brunello tasted. Initially it appears to be slightly drying, but with air time, the fruit gained weight and intensity. Berry and tobacco notes take center stage and there’s a slight earthy funk on the back end. Decant this. 90 points. SRP ~ $45. The Antinori empire is vast and centered in and around Florence and Chianti. The name is a giant in Tuscan wine making and with good reason. Antinori produces some of the regions greatest wines. 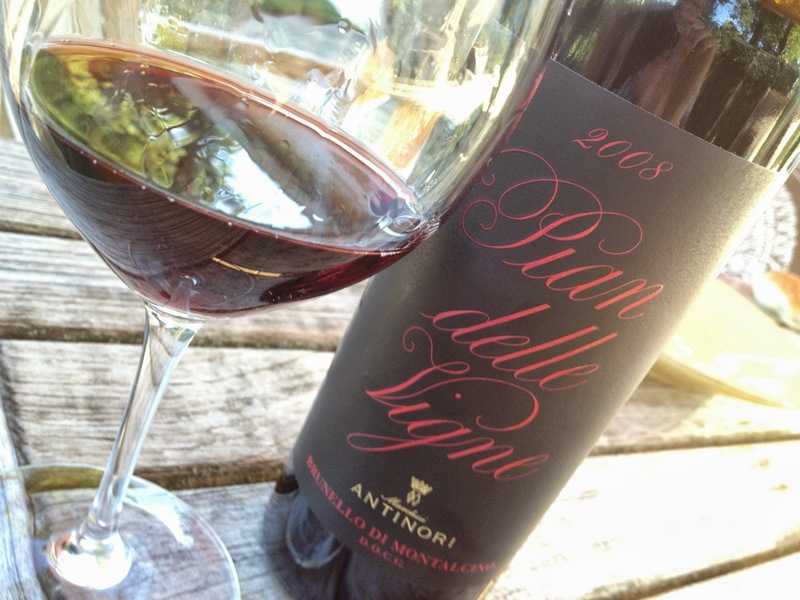 Not too long ago Antinori acquired the Pian delle Vigne in Montalcino and began producing Brunello. The 2008 Pian delle Vigne Brunello is dark ruby to garnet. Like the Casanova, the barrique application here has fixed the color of the wine much darker than grande botti would. The aroma is nice, but more exotic with indian spices, mocha, and red fruits. On the palate the wine is slightly one dimensional with a nice ripe core of berry fruit faintly accented by spices and toast. This is fairly tannic for the vintage and almost atypical. A solid effort. Not great, but very good indeed. 89 points. SRP ~ $50. When you hear Montesoli, think Baricci. Nello started this wonderful estate and now his two grandsons are at the helm. When I sat down to enjoy this wine, I was very curious to try it given how much I loved the 2004, 2006 and 2007. My notes for the 2008 Baricci Brunello start out with this: “Mmmmm Baricci!” This is medium ruby in color with the trademark copper hue at the rim. The Montesoli terroir comes through in the fragrant flowers, dried and fresh herbs and wild berries on the nose. On the palate, the flavors follow the nose. It’s all fruit and terroir driven – there is no hint of oak aging in the least. I remember Francesco Baricci telling me at VinItaly – “I let the site speak” – in this case, I wholeheartedly agree. The wine is a touch drying on the finish which cuts the intensity of the fruit short a bit. Very nice effort. 90 points. SRP ~ $45. 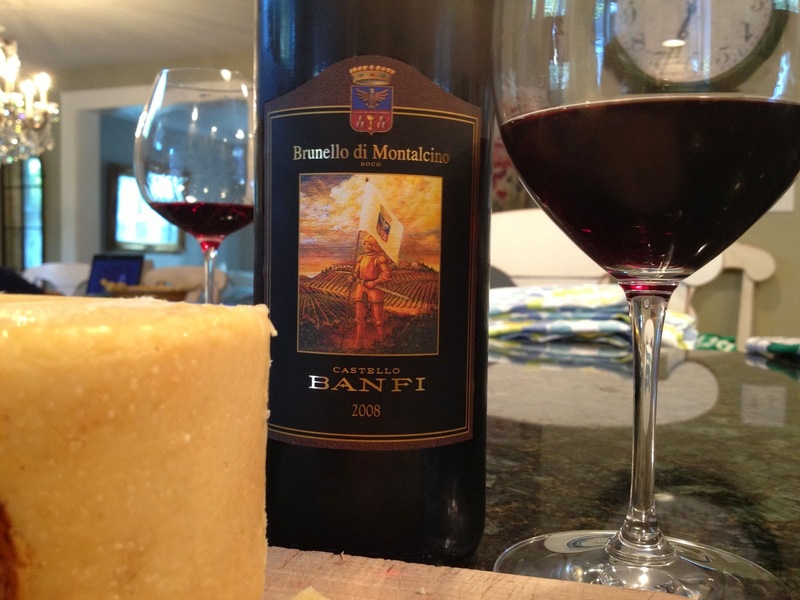 Ever since I first tasted Fanti’s 2008 Brunello at a trade tasting in April, I was shocked at the sudden departure in the color of their wine. What used to be an impentrable black color has now been turned into a bright ruby with brick reflections. The change? Primarily because of the oak aging regimen, as Elisa Fanti explained during our interview. It’s a noticeable contrast. 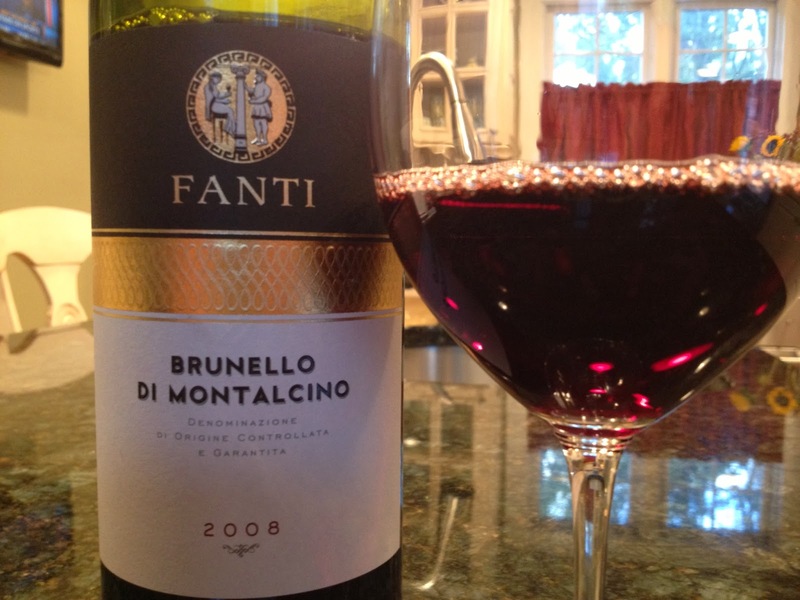 The 2008 Tenuta Fanti Brunello is a delicious wine. Medium ruby in color with a trace copper rim, the wine is boisterous on the nose with intensely perfumed flowers, eucalyptus and ripe crushed berries. On the palate, the bright berry notes yield to some fennel highlights and some leather. A bit more tannic than most, this seems to cause some drying toward the finish. Well balanced, in a “vintage typical” manner. “This is very nice”, I wrote and it’s a producer that lovers of traditional Brunello will want to re-visit. Good value. 90 points. SRP ~ $40. Back in March I had the opportunity to visit with Marco Sassetti of Il Palazzone and chat with him about his new winery, the upcoming vintages and was struck by his passion. The team at Il Palazzone works tirelessly and in 2008, it paid off. The 2008 Il Palazzone Brunello is striking. It’s a brilliant medium ruby with violet reflections. On the nose, which is slightly shy at first, are intense floral, ripe wild berry, and herb aromas. Penetrating. While I suspect this will only gain aromatic complexity as it ages, it’s on the palate where this wine is strutting it’s wares. There is a medium to full bodied core of intense ripe berry fruit, with fresh leather, and a mouth watering, spicy freshness to the whole package. The balance is nearly perfect between acidity, fruit and tannin and the finish goes on and on. This is delicious, and one of the best wines in this report. 93 points. SRP ~ $90. Verdi wrote: “La Donna e mobile”……. This is my experience with the next estate. One wine good. The next, not so much. It’s a pattern I dislike when trying to buy wine for my cellar. In this case, Joanie doesn’t love Ciacci. 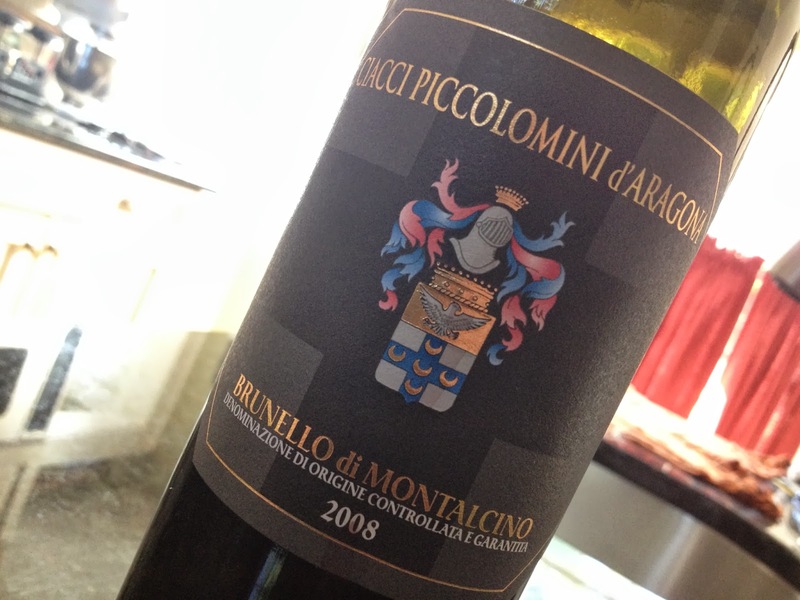 The 2008 Ciacci Piccolomini d’Aragona Brunello is a classically made Brunello of simple proportion. The nose offers up pleasing aromas of dried herbs and berries. There’s a hint of earth on the palate, but for the most part, flavors follow the nose with a sense of obligation rather than exuberance. Medium bodied and fairly well balanced, the fruit fades a little toward the end and there’s a slight bitterness to the finish. This is one that’s best to skip in 2008. 86 points. SRP ~ $34. And some of the wares from the table……..
Tastings like this shine a light very quickly on the overall character of a vintage. As I remarked at the outset, many of the wines shared similar characteristics. Therefore, when something was unique it seemed to stand out even more. It was interesting to observe. Equally, it was intriguing to discover wines that I did not have much familiarity with. 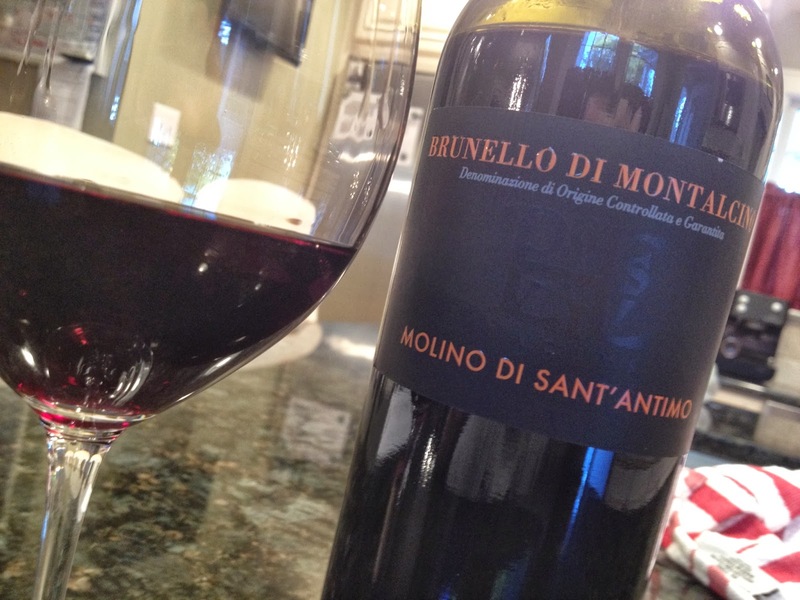 The 2008 Molino di Sant’Antimo Brunello is a solid “entry level” Brunello. The product of Carlo Vittori and his family, the Molino estate sits at the base of Mount Amiata on the edge of the Brunello zone. The wine is a dark ruby and deeply colored. Swirling reveals dried herbs and spices along with red cherries and a hint of dirt. The fruit is a touch lean on the mid palate but there are lots of dusty tannins that make for a nice mouthfeel. Medium bodied and good value given the price. I look forward to seeing more from this producer. 87 points, SRP ~ $24. I’ve written much on these pages about Mastrojanni and without mincing words, they continue to impress. Whether it’s their Rosso, their estate Brunello or their single vineyard wines, they are well made up and down the portfolio. Such is the case with the 2008 Mastrojanni Brunello. This medium violet colored wine has impressive aromas of crushed cherry and sandalwood. Wonderful ripe fruit on the nose and palate. 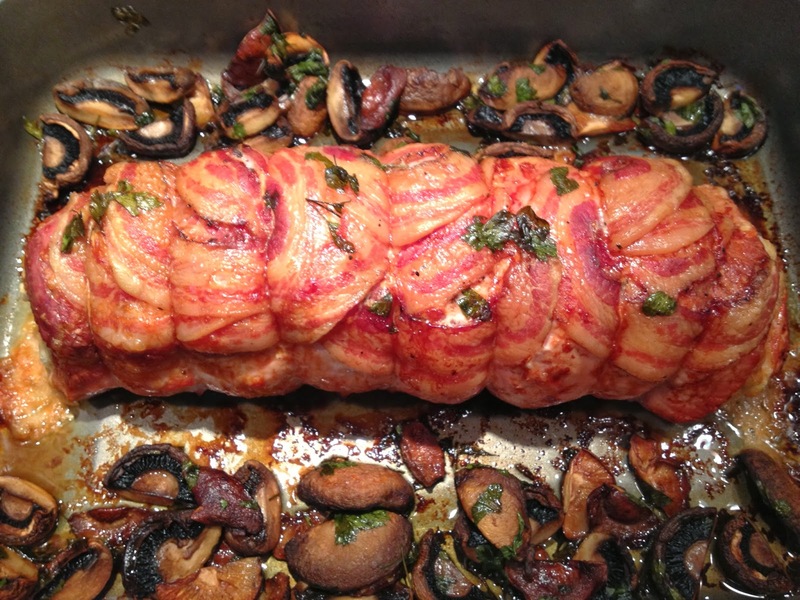 Flavors add some spice and fennel to the core of fruit which is very elegantly presented. Lovely with cheese and sauteed porcini; this finishes long and spicy. 90 points. SRP ~ $45. One trend that’s been noticeable over the past 10 years or so is the expansion to Tuscany by wineries out of the area such as Gaja’s expansion to Tuscany, or even Antinori’s expansion out of his general area and into the Maremma. Such is the case with the next wine; the Montalcino estate of Veneto’s Allegrini. 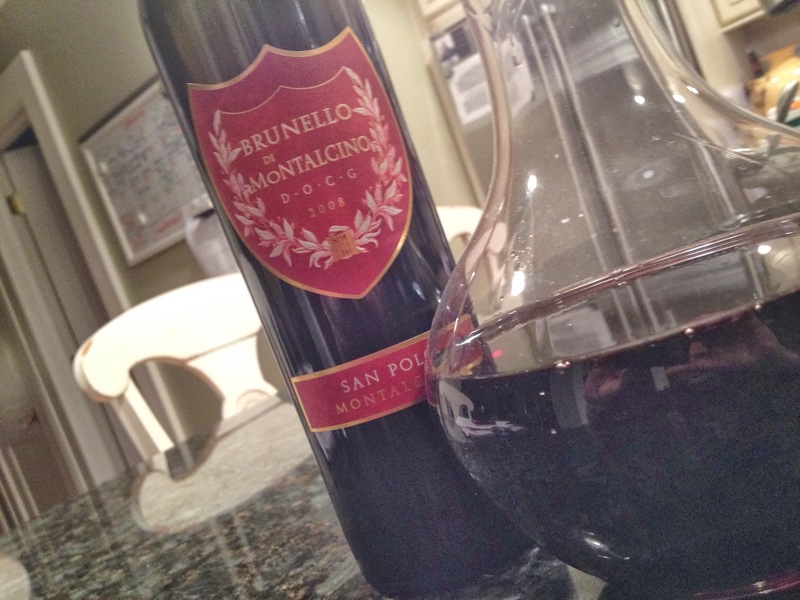 The 2008 San Polo Brunello is a full, deep garnet to ruby in color. There is a slight copper hue to the rim. This newer Brunello shows some flash. On the nose it’s got plenty of crushed cherry fruit, some savory spice and a bit of leather. Quite nice. On the palate, there’s a hint of oak that mingles with intense floral notes and more moderate cherry fruit. The finish shortens up just a little, but overall, this is a very nice effort. 89 points. SRP ~ $50. In addition to their wonderful estate Brunello, Castello Banfi also creates a single vineyard wine in the namesake of their castello: Poggio Alle Mura. 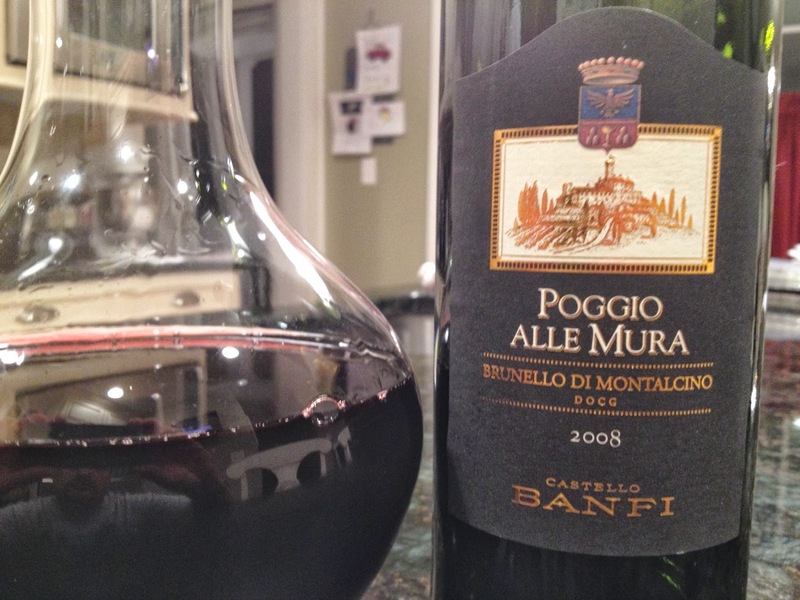 Poggio Alle Mura was created as a result of Castello Banfi’s unique clonal research program that identified the 3 best clones of Sangiovese that are suited to Montalcino, and their own, terroir. 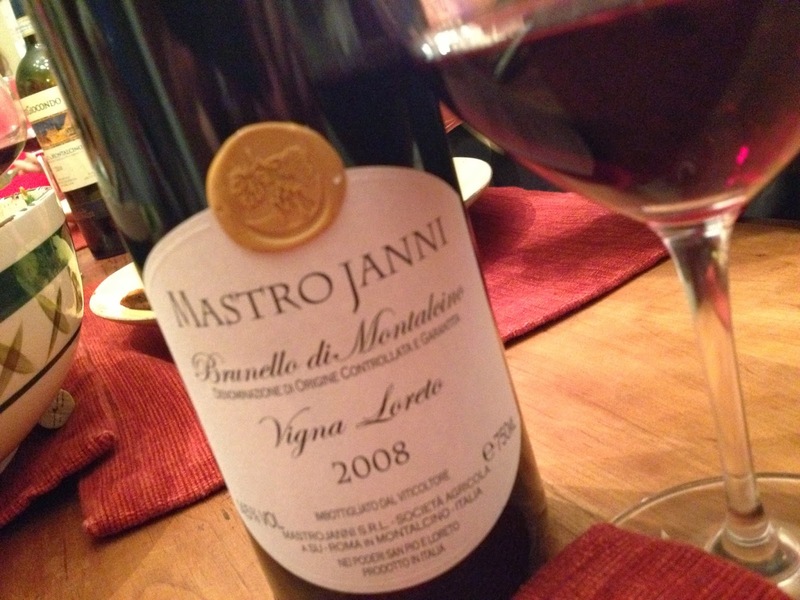 Like it’s younger sibling, and true to the estate’s form, the Mastrojanni Brunello San Loreto did not disappoint. The 2008 Mastrojanni Brunello San Loreto is a single vineyard wine made from a strict selection of only the best grapes that the vineyard produces. Declassified fruit goes into the estate Brunello. The wine is a deep, classic looking ruby red. On the nose the notes of menthol and anise provide lift to the slightly earthy core of red cherry fruit. After some additional aeration, the nose gained some pronounced floral notes. On the palate, the flavors follow the aromas with good intensity. Maybe could be a touch more concentrated given the single vineyard designation, but this is delicious and it’s hard to find fault here. 91 points SRP ~ $65. Tucked away on the slopes facing Sant Angelo in Colle is the tiny 8 acre estate of Villa i Cipressi. An artisan producer that began simply by making wine and honey for local sale and then, in 2000, expanded their production commercially. 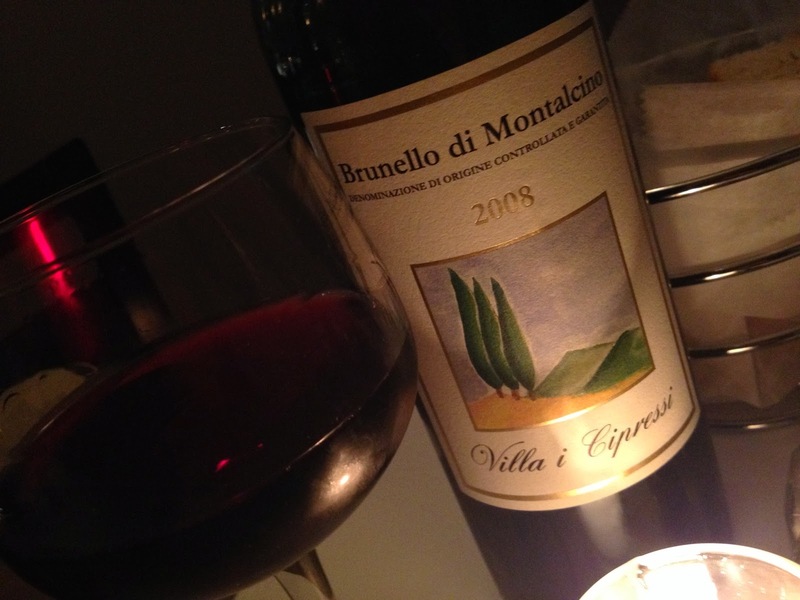 The 2008 Villa i Cipressi Brunello is a classy effort. Deep ruby in color, the wine exhibits aromas of newly turned earth, Tuscan brush, berries and anise. Very nice to smell. On the palate, the wine is shy and needed some time to express it’s charm. Rustic, with well dilineated flavors of crushed berries, spice and soft earth tones. This is very ready to drink, with nary a tannin in sight. A very good effort and a nice value. Paired nicely with Grilled Pork Chops Giambotta. 89 points. SRP ~ $35. Frescobaldi is an iconic name within the Tuscan landscape. 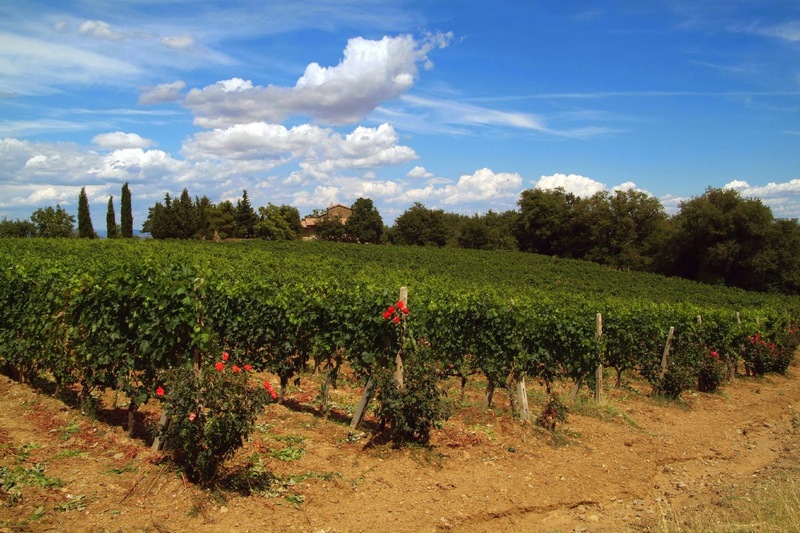 Located in the southwest quadrant of the Brunello zone, it’s CastelGiocondo estate produces ripe, modern Brunello. 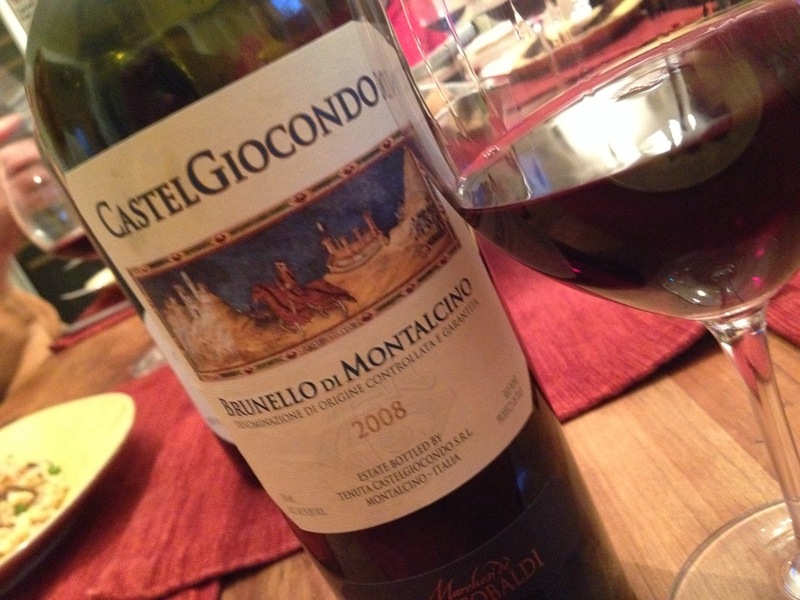 The 2008 CastelGiocondo Brunello is no exception. The wine is a deep, dark garnet color. It trends toward black and is one of the darkest wines from the vintage that I’ve seen. The aromas from the wine are very pretty with lots of flowers, red fruit and spice notes. Earth and leather flavors compliment the crushed red fruit on the palate and there’s a hint of vanilla spice from the obvious, but judiciously applied wood. This is well done, although clearly in a distinct style that many may not appreciate. It’s the modern interpretation of Brunello. 90 points. SRP ~ $49. 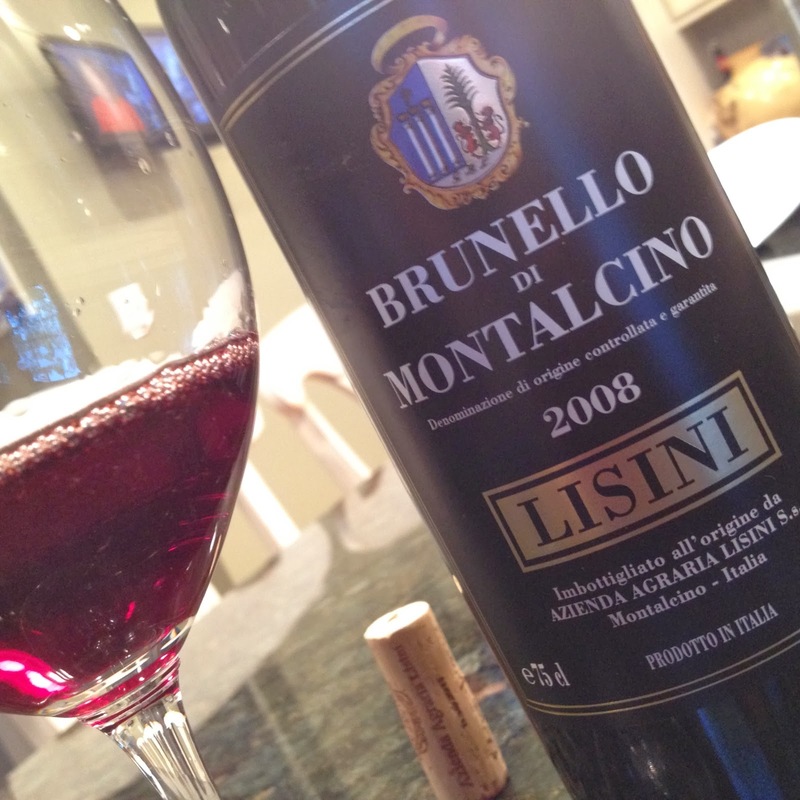 The 2008 Lisini Brunello is classically crafted. The medium ruby wine, with brick and copper hues is exactly what you’d expect from this large cask producer. The aromas display ample notes of crushed berry, lavendar and spice. Very pretty to smell. On the palate, this appears to have slightly more tannic stuffing than most. Flavors follow the nose, and the medium weight wine is balanced well with refreshing acidity. Definitely a product of this vintage, I would not cellar this wine. It’s in a good place now and will drink well for 3-5 years. 90 points. SRP ~ $45. The Bacci family’s estate in Montalcino also lies in the southern quadrant of the zone. I’ve written about the wines of Renieri many times on these pages and they have consistently impressed. So I was a little surprised, and more than a little disappointed, in this most recent example. 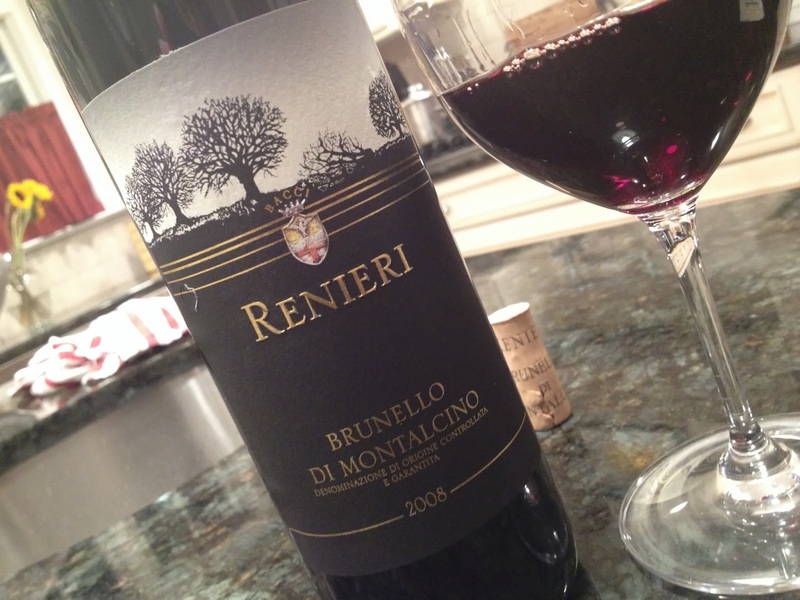 The 2008 Renieri Brunello is a dark ruby – a deeply colored wine that almost belies the intensity of the fruit lying in wait. The nose of the wine is pleasant, with soft berry tones, a whiff of vanilla and some savory, piney-rosemary spice notes. On the palate, the wine is very austere. A dried out sensation to the fruit leaves the taster with the impression that the tannins carrying this wine are already eclipsing the character of the fruit. Frankly, it’s underfruited and rather monolithic in it’s presentation. A disappointment. 85 points. SRP ~ $34. The Mocali estate was acquired by the Ciacci family – distant relation to the more notable Ciacci’s of Piccolomini, in the 1950’s. This tiny estate in southwest Montalcino produces early maturing Brunello from 6 tiny hectares. Mocali is typically one of the first wines of the vintage to arrive on the market and I always look to it as sort of a harbinger of the vintage. 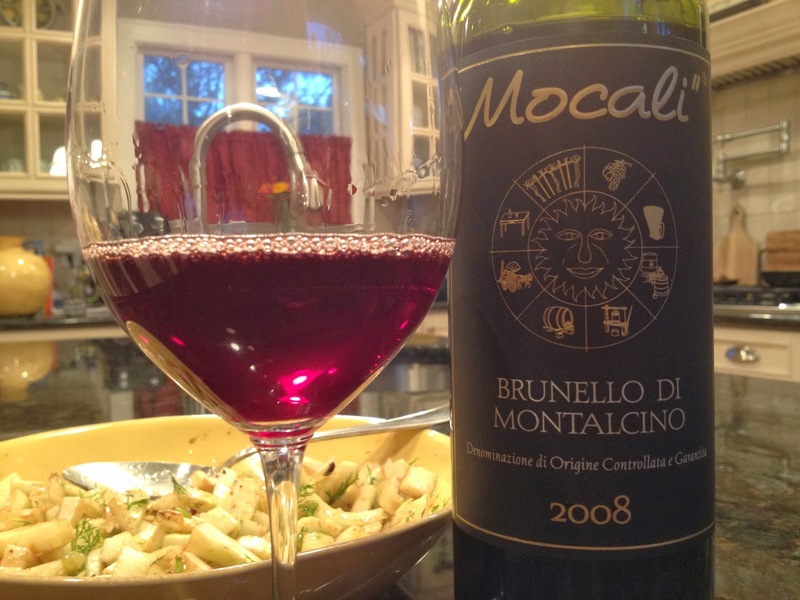 The 2008 Mocali Brunello is a light to medium ruby in color with some violet reflections. On the nose, the wine displays pretty aromas of crushed berry, anise and lavendar laced flowers. Really very nice. On the palate, this medium bodied wine is lovely and approachable. It’s fine tannins are smooth and silky and provide nice structure to the core of ripe berry fruit which is accented by sweet pipe tobacco. Paired very well with fennel salad, stuffed mushrooms and homemade meatloaf. This is a wonderful value and will drink nicely for the next 3-5 years. 90 points. SRP ~ $29. I have to expound on this specific review a bit more in order to provide my readers with as much value as possible. I recently read a professional review from a prominent publication on this very wine. Tasting is never more than one person’s subjective perception at the time. I grant that. The reviewer in question scored this wine 92 points and gave it a positive review. I have no issue with it. However, this person then recommended that this wine would drink best from 2016-2032. I have a major issue with that. Anyone with significant experience drinking and enjoying Brunello at it’s best will tell you that even in great vintages, the best wines will be hard pressed to be “at their best” almost 25 years from the vintage date. 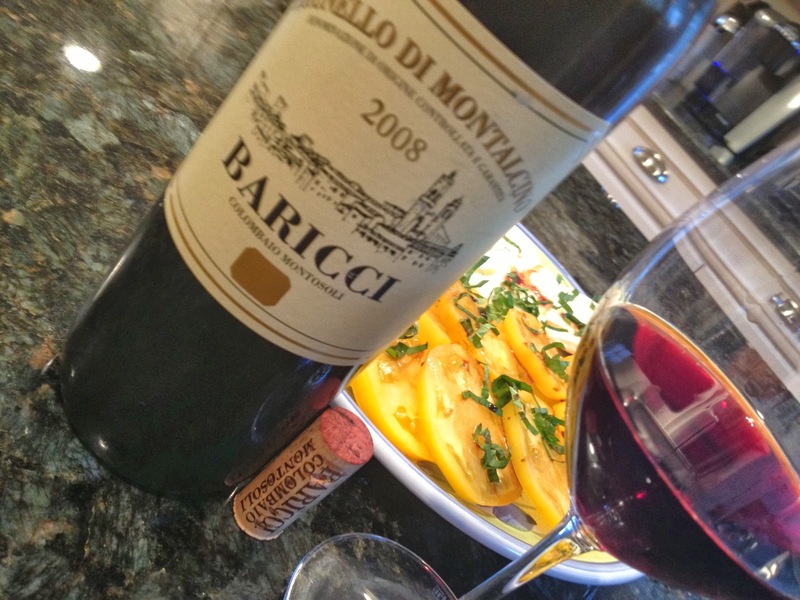 Mocali is a light weight wine by Brunello standards and 2008 is hardly an age worthy vintage. The notion that this wine needs to be 8 years old before it enters it’s prime drinking window is not only foolish but borderline irresponsible to suggest to someone that is presumably reading your publication for guidance. I have many Brunello from the classic, amazing, and age-worthy 2004 & 2006 vintages in my cellar, and I suspect not many of them will see the light of their 25th birthday. However, if you want to find out what an aged Brunello tastes like, these are the vintages to try it with. Certainly not with the “drink me now” 2008 vintage. You may take my counsel as you wish, but I suggest that if you save this wine until 2032, you will not be rewarded for your patience. 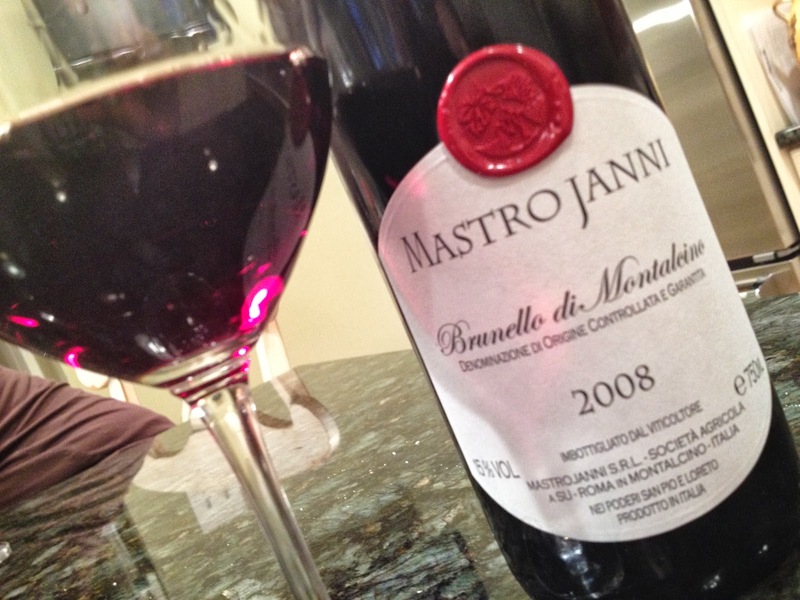 This past June I tasted the Pertimali Brunello at the Massanois trade tasting. The wine was not yet released at the time, but it made quite an impression and reminded me about one of my favorite axioms: “Producer over Vintage”. This tasting reveals a wine very true to the house style of Pertimali, but was not quite as intense as the sample I tasted back in June. 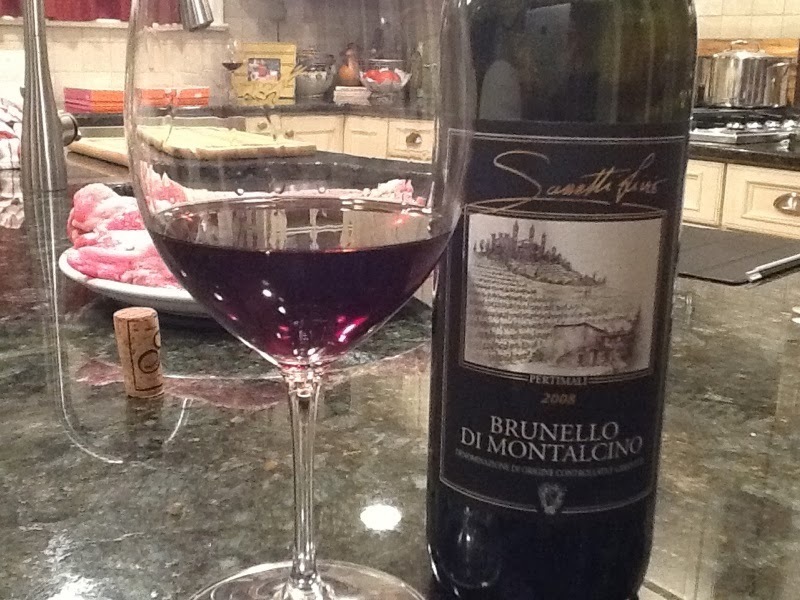 The 2008 Pertimali Brunello is a dark ruby with crimson like reflections. The aroma of the wine is redolent of dark cherries, leather, cured meat and tobacco. It’s reflective of the earthier side of Brunello. On the palate, the wine is medium to full bodied with a solid core of ripe black cherry fruit. Worn leather and salume are present as well. Some may find this “funky” but to me, it represents the more meaty side of Brunello. It’s rustic and less “fresh” but do not read that as a negative quality. The wine is well structured and balanced and will reward cellaring for 5-8 years. This may not be everyone’s cup of tea, but I really like it as a change of pace. It’s rather different than many of the wines in this report. 92 points SRP ~ $45. Overall, I was very impressed with the collection of wines tasted for this report. Just 15, or maybe even as little as 10 years ago, a vintage of this nature would have produced wines with greater variability in quality. However, the improvements in winemaking knowledge and dedication over the past 2 decades are evident in these wines and contribute mightily to the success of this vintage. The 2008’s greatest attribute seems to be the heightened floral aromatics of the Sangiovese and the freshness of the grapes natural acidity which provides the wines with a vivacious “lift” on the palate. They are fresh, graceful and elegant Brunellos and there was not a single wine tasted that I thought required cellaring to show its best. The report produced three standouts: The Mate, the Il Palazzone, and the Castello Banfi Poggio Alle Mura. I would happily seek these wines out for my cellar and drink them over the next 5-8 years. However, like the remainder of their 2008 counterparts, this vintage isn’t one to age. Their charm and appeal lie in their freshness and their approachability. If you make the mistake of cellaring these wines too long, that freshness will fade and the exuberant, playful nature of these wines will suffer. My biggest complaint? Pricing. I like to think that when a vintage is less than great, prices will reflect that, but I know this isn’t the case. While Brunello prices have eased dramatically over the past 5 years, these 2008’s do not represent value compared to better vintages that are still on the market. 2006’s and 2007’s are still very easy to find and indeed, many 2004’s are available if you search for them. My buying advice is this. Use the reviews above to guide your purchases. Hopefully I’ve illuminated the style of each wine so that you can align my comments with your preferences. Buy in judicious quantities – so that you have enough to keep your hands off the better vintages maturing in your cellar. Finally, if dining out, choose 2008’s from restaurant wine lists with confidence. They should represent very good value in that arena and will be approachable and food friendly. Thanks again to all the producers, importers, and distributors who contributed to this report and thanks to you, the TuscanVines readership that makes this all possible. John, this is a very impressive effort, thank you! However, it seems, except for the Mate, this is a vintage that'll go down in the books (Vintage charts) as lack-luster! Dennis, the three wines I mentioned as standouts were just that. There were likewise a few to avoid. Everyone else played between a consistent and narrow field. This vintage surely has it's place. But I can't argue with your characterization. It's fair. And as I said, when prices for better vintages are essentially similar, it's an easy call. Thanks as always for commenting. Thanks for this useful assessment. Kerin O'Keefe recently wrote a 2008 vintage report in Decanter and, although she tasted lots of different wines from your list, she came to similar conclusions on the vintage in general, ie not for long ageing, but not to be underestimated. It's a similar story in Montepulciano in this vintage. I have found some delightful wines from 2008, ready to drink now or very soon. By no means lightweight but not as structured and broodingly intense as 06, and not as full and plump as 07. It reminds me of 05 in that respect. Straightforward deliciousness is no bad thing, we don't want to leave every vintage for 15 years! The best producers will always make good wines in almost any vintage and those that make a Riserva in the best years, have not done so for 08, so the best fruit will go into the straight Brunello. You're right as well that there don't seem to be so many 08s around. I have only tasted 5, whereas I've tasted 20 or so 07s, and about 15 06s. Of the 08s I have tried, The Fuligni (one of my 3 favourite BdM producers consistently) is outstanding, a gorgeously elegant wine, with surprisingly fine and silky tannins. However, some lovely complexities that may take time to develop, so while I have a few bottles to enjoy young, I am resolving to leave 1 bottle for 10 years, if I can keep my hands off it! I agree with you about Baricci, they are a class act and a modest and humble family making a true honest wine with no pretension. Il Marroneto is another of my favourites, and I was delighted to see Alessandro's Madonna delle Grazie 08 receive tre bicchieri in the Gambero Rosso. Both this and his regular Brunello 08 are excellent and quite approachable. Not sure about 09, it was another hot year but I should have the chance to taste a wide range of them at a big tasting event, once they are released early next year. I'm very excited about the potential for 2010 from the standard of the Rossos I've tasted. I agree with all your sentiments and I have not seen the Decanter article that you mention. This is akin to 2005 although I think I enjoy 2008 better. They seem even fresher to me. I really enjoyed the aromatic profiles of these. And of course you're right – I gushed about the 2008 Piaggia Carmigano Il Sasso when it was released and raved about the aromatics. Now I see why. Plus, with a dollop of Cabernet in the wine, it gives the wine a bit more muscle than some of these Brunello exhibited. I loved that 2007 Madonna Brunello from Il Marroneto. I'm still looking for more. I have to say, that I dont agree with you about the vintage. I think its like 1997 and 1999 where all the journalists wrote, that it was incredible vintages with long potentials and so on. I call them journalist vintages, because the down rating of 1998 shows for most of the wines, that 98 for sure was better that 1997. Most of the 97 are dead now, and the 98's are still going up, for sure for the best producers. Now we have 2007, that in the beginning was rated high, but i dont agree. They are for we wines with a shorter life, and I will bet a lot, that 2008 will have a longer life. The wines are for sure more elegant and more classic. John, I agree that 08 is better than 05. Structure-wise very similar but the 08s are indeed more perfumed and aromatic, and more classic whereas 05s can be lightweight. The 08s are just lovely for drinking now. Michael- you make some good points. 98 is indeed a 'sleeper' vintage, which has shown more long term, and 97 and 07 were definitely both overrated. The best 97s are still great though (Fuligni stunning) but 07 is not a long ageing vintage in general terms. 04 and 06 are the best recent vintages for ageing but even 06 is variable according to producer and subzone. You are right that 08 may age well in the long run, but it doesn't NEED to is the point, the tannins are so silky and there is very little youthful 'tightness' to these wines, so they are already a pleasure to drink. However that does not mean that the best examples will not age very well, the best wines have complexity that will take time to develop, but, because they are not so structured, they are already delicious and hard to resist! All vintage generalisations are always difficult and producer is more important. You are right Michael that most of the best Brunellos are from smaller producers near the higher altitude vineyards around the town, but they are smaller production and not necessarily easy to find everywhere. Thanks for reading and commenting. We can surely disagree on our suspicions regarding 2008. I enjoy the wines now and I think you do too. They may last, but I don't think they'll improve much. But that could just be personal preference as to what "improving" means. I think 2004 and 2006 are vintages to age, not 2007 so we agree there – and that the vintage reminds of 1997. I met Giacomo Neri at Gambero Rosso and talked to him at length. I base my assertion about the Casanova being aged in barrique from what he told me. Perhaps I misunderstood him, but I didn't think so. I'll have to check my notes. What does the size of the producer have to do with wine quality? I have heard that argument over and over and over. I flat out reject it. Simply because something is small and "Artisan" doesn't make it good. And the reverse applies. Some of the greatest wines in the world (1st Growth Bordeaux for instance) have case productions in the tens of thousands. If the quality is good, it's good – period. I try to review wines based upon the quality irrespective of the style. Unless the style is so extreme that it affects the quality of the wine. Tasting is subjective and at the end of the day, I think that's how we view things. But there is certainly nothing inherently wrong with certain wines simply because a producer is large versus small. Adam, well said. As usual I think, we agree. Are you sure, that its the white label, Casanova di Neri, you are writing about. I think that note is strange. This wine does not smell of oak in my world. I am sorry John, but for me i looks like, you wrote the note of oak, because you thought it was a lot barrique. The white label come from the vineyard just in front of the winery. This vineyard is used for the White Label and the Rosso di Montalcino. The other Brunello comes from a different position. Tenuta Nuova is from S. Angelo in Colle, and Cerretalto from a very special place south east just near the Cerbaiona Brunello vineyard. The position is only 150-200 meters asl, and the ripening of the grapes very difficult compared to the others. Harvest time is around 3 weeks later than the Tenuta Nuova vineyard. The time in barrique for Cerretalto is less than any other of the Brunelli. The great vintages are not also the same for the wines. Fx was the Cerretalto produced 96 but not in 98. Because of other conditions. Giacomo made the Cerretalto 2005, but when he arrived to the bottleing, he decided to cancel, and they put all the Cerretalto into the White Label. The white label 2005 was of that reason more concentrated this vintage. While I absolutely agree with you that does not necessarily = good and big does not necessarily = bad, I do tend to favour small producer wines personally, because there is more of a personal story behind them, a person or family who overseas the whole operation, not a big faceless corporation. I have an inherent distrust of very large companies in food and drink production. Not that we are talking very large companies here, Banfi aside, there are no big corporations in Montalcino, and size is relative. You are of course correct that the quality of the wine is the most important factor by far. oh and of course Mastrojanni are now owned by Illy coffee, but it hasn't affected quality or the day to day running of the estate. Interesting. This whole discussion of Quality relative to Size just might be a good topic for it's own blog post. I don't necessarily disagree with you, but your whole first paragraph is nothing more than a stylistic one – not a qualitative one. (And I acknowledge you realize that) Many people don't realize that. Big = Bad, Small = Good. It's simply not true. One of the smallest producers is Stella di Campalto. I love her wines, but they don't fit the stylistic mold that you mention above at all. The bottom line for me is, I enjoy and appreciate wines in many styles as long as the wines taste like where they are from and as long as the style isn't over done. There are many large corporations at work in Montalcino – or at least many with corporate ownership. Castello Banfi, Caparzo, Pian delle Vigne, Mastrojanni, Podere i Ripe, San Polo, Frescobaldi, even to a degree, Il Palazzone. It's the extent of influence that matters. Quality has to be job one. Not profits. Anyway….I think I see another article brewing out of this talk. It is indeed a stylistic point, and a personal preference, although many of the small producers in this area would also contend that their's are the real classic Brunellos, from the original zone and that the other styles are of the big companies and outsiders. I'm not saying they are necessarily right but I have some sympathy with that view.It's no bad thing, though, to have the range of styles we have from Montalcino, and there is no point arguing over which is 'right' or 'better' because personal preference is the key, and there is room (and a market) for both. I don't know the Stella di Campalto wines, but my point was not that ALL small producers make the more classic elegant Brunello, but that most of the Brunellos in that style come from small producers, largely due to location. And yes I missed a few other big companies, Pian delle Vigne is Antinori, Frescobaldi own Castelgiacondo, and of course Cinzano own Col d'Orcia. You could even add San Felice who own Campogiovanni. I am not against these big companies per se, and as I say I think Col d'Orcia and Mastrojanni are really excellent, I just generally tend to prefer the Brunellos of the more northern producers who are generally small operations…. and I naturally favour and like to seek out wines from small independent estates because of the personal story and the close connection of the owner or family behind them, and the increased likelihood you are getting a true representation of the region. Partly it's probably because I have been a small independent myself, ( I ran my own small restaurant for a number of years) and I identify with that.